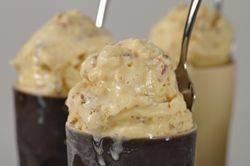 Maple Pecan Ice Cream combines two native American ingredients, maple syrup from the North and pecans from the South. This ice cream is made with a custard base so it is wonderfully rich and creamy. And I like how the maple syrup adds a sweet and nutty flavor to the ice cream, which goes so well with the buttery caramel flavor of the toasted pecans. Pure maple syrup is a beautiful reddish-brown aromatic liquid that has a distinctive taste and it's produced from the sap of maple trees grown in Canada and the Northeastern part of the United States. It is classified by color and density. In this recipe the maple syrup I used was labelled "Grade A - Amber Color Rich Taste". Also, pure maple syrup is not to be confused with corn syrup flavored with artificial maple extract, sometimes called 'pancake syrup'. Now, the toasted pecans are not added to the ice cream until the custard has been churned. You can chop the pecans very finely or leave them in larger chunks. Also, if you cannot find pecans, an excellent alternative would be toasted walnuts. As this recipe only uses egg yolks, there is always the question of what to do with the leftover egg whites. Meringues (Meringue Cookies, Meringue Hearts, Meringue Mushrooms, Pavlova) are always a good way to use egg whites as is the French Macarons, Chocolate Angel Food Cake or Angel Food Cake. Maple Pecan Ice Cream: In a small saucepan, over medium-high heat, bring the half-and-half, maple syrup, and salt just to a simmer (the milk just begins to foam up). Remove from heat. Meanwhile in a stainless steel (heatproof) bowl beat the egg yolks and sugar until light and fluffy. (You can do this with a wire whisk or hand mixer.) Then gradually pour the hot half-and-half mixture into the egg yolk mixture, making sure you keep whisking constantly so the eggs don't curdle. If any lumps do form, strain the mixture. Immediately remove the custard from the heat and stir in the heavy cream and vanilla extract. Cover and let cool to room temperature and then refrigerate the custard until it is cold (at least eight hours or overnight). Transfer the cold custard to your ice cream machine and process according to the manufacturer's instructions. Once made, stir in the toasted and chopped pecans and transfer the ice cream to a covered container and store in the freezer. If the ice cream becomes too hard, place in the refrigerator for about 15 - 30 minutes to soften before serving. Note: To toast pecans, preheat oven to 350 degrees F (180 degrees C). Place pecans on a baking sheet and bake for about 8 minutes or until the pecans are fragrant and lightly browned. Cool and then chop until pecans are in small pieces. Makes about 3 cups (720 ml). Preparation time 30 minutes.